It was ten years ago today that I witnessed at first hand the effects of war on innocent civilians. 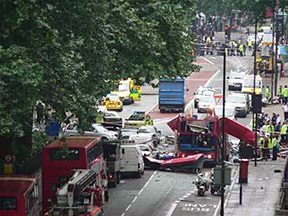 What had seemed like a mundane Thursday morning – commuting from Hammersmith to Old Street – turned into a horror film, as I found myself late for work and 50 yards in front of the bus bomb in Tavistock Square. At first I thought it was a building that had been blown up as all I could see when I turned around was stuff in the air. I sprinted into the revolving doors of the nearest office and, from there on, witnessed the most traumatic events of my life. A bloodied office worker with a pinstripe suit, ripped to pieces like a cartoon character who had been in a lion’s cage, wailed and walked with his arms outstretched. I felt powerless to help. And then I felt guilty that I had not done anything. So I tried to go out of the office to see if I could support someone in some way. But when I walked out on to the pavement I was yelled at by a man in a reflective jacket and told to ‘get back in the building’. I phoned my manager to tell him I’d nearly been blown up by a bomb and would be late. It seemed like a natural thing to say but obviously it was a lot for him to take in and, as I was trying to explain, the signal cut out. It was surreal. How could I be in the middle of all this? When eventually I walked out of the office and ducked under the police tape, I was scared that every bus or vehicle could blow up. I had no confidence in anything at all. I was livid. When was Tony Blair ever travelling on a tube train or on a bus going to an office to earn enough money to pay the rent? When was he not being protected by security? I had no wish to be a participant in an ideological clash of ‘values’. The only heroism I wanted to show on a Piccadilly Line train was being extremely patient as I waited for the lights to change at Hyde Park Corner. And speaking of Hyde Park Corner signals, two million people (including me) had already sent a clear signal to Tony Blair and the government that we did not want to invade Iraq and start killing innocent civilians there. 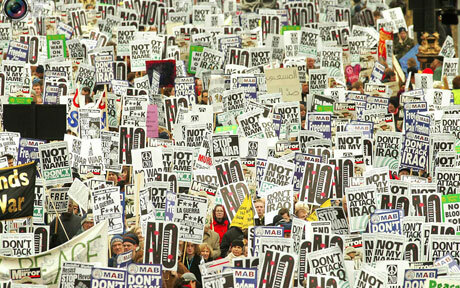 I was part of the largest demonstration of my generation. 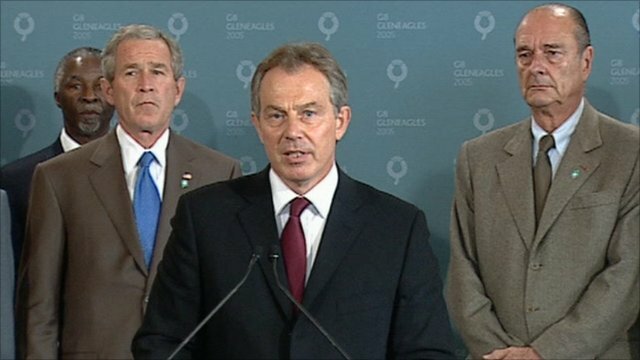 But Tony Blair had decided to follow George Bush’s lead. That was his ‘value’, not ours. So, now on 7 July, civilians in London were being asked by Tony Blair to pay the price for this war. There is no doubt that the Iraq war and the London bombings were linked. It was revenge. No civilians should have to pay the price for warmongering politicians. ‘Collateral damage’ has far-reaching consequences. The number of dead is only part of it. It casts a shadow over the families and friends of those who died; it causes lifelong trauma to those who witness it; and it breeds resentment and anger towards those who inflict it. My anger with Tony Blair was such that I didn’t join the Labour Party until he had stood down as leader. Recently Ed Milliband supported the government in air raids on ISIS targets in Iraq. I was opposed to this. These bombing missions are not precise and they do not hit the right targets all the time. No matter what the propaganda says, there have been civilian casualties. In my opinion, we have authorised the bombing of innocent people who are going about their lives minding their own business, just as I was ten years ago. Labour doesn’t have to toe the line on air strikes on Iraq or on Syria. It is not true that the end justifies the means. Killing innocent people will take away any moral high ground. There has always been a strong anti-war faction in the Labour Party. From George Lansbury’s idealistic attempts to make Hitler see reason (he wasn’t alone in this) to Michael Foot and others marching against the bomb, Labour has always had anti-war activists who can see that violence does nothing more than escalate the problem. It is for this reason that I am supporting Jeremy Corbyn for leader. He is the only candidate who has consistently opposed the murder of innocent civilians. This entry was posted in Uncategorized on July 7, 2015 by crispinflintoff1.